Bees from the same hive visit about 225,000 flowers per day. 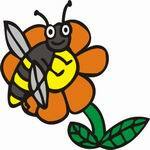 One single bee usually visits between 50-1000 flowers a day, but can visit up to several thousand. Queens lay almost 2000 eggs a day at a rate of 5 or 6 a minute. Between 175,000-200,000 eggs are laid per year. The average hive temperature is 93.5 degrees. Beeswax production in most hives is about 1 1/2% to 2% of the total honey yield. During honey production periods, a bee's life span is about 6 weeks. Honeybees visit about 2 million flowers to make one pound of honey. A bee travels an average of 1600 round trips in order to produce one ounce of honey; up to 6 miles per trip. To produce 2 pounds of honey, bees travel a distance equal to 4 times around the earth. They consist of a pair of compound eyes made up of numerous six-sided facets (28,000 in some dragonflies, 4,000 in house flies) plus three simple eyes. The bee is capable of navigating, even on a cloudy day, by cloud-penetrating ultraviolet light.